As Steve Vai’s engineer for the past decade, Greg Wurth knows his way around getting optimal guitar sounds in the studio. But when he shared his top tips with MusicRadar, he was clear about one thing up front: all the gear and flash in the world can’t compensate for lack of basic knowledge. Wurth grew up in San Diego, California, and early on became enamoured with the classic rock of The Beatles and Led Zeppelin, as well as the polished pop sounds of Michael Jackson. Entering his teen years, his tastes grew to include hard-rock bands like Rage Against The Machine, Tool and Deftones. He began playing guitar, but soon found that his passion was in recording the instrument rather than playing it. After high school, he relocated to Los Angeles to study audio engineering. 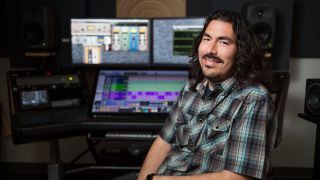 Through the school’s career placement program, he interned in studios, eventually meeting award-winning producer/engineer Neil Citron, who was producing Steve Vai at his Mothership studio and was in need of an assistant. Wurth got the job and eventually became Vai’s engineer. The two have worked together on close to two dozen projects - singles, albums, digital releases, and remasters. “Our relationship has grown quite naturally, very organically,” he says. Wurth’s discography includes a diverse range of artists ranging from Mary J. Blige to L.A. Guns, Tony MacAlpine, Indigenous, and 2Cellos. In addition to staying busy in the studio, he has an audio products company, which launched in 2016 with a 16-channel summing mixer, The Oracle. He manages and maintains a YouTube channel, Inside the Studio Workshop Series, and in 2017, he presented a 90-minute course via Lynda.com entitled Fundamentals of Pro Audio Equipment. When MusicRadar spoke with Wurth, he was wrapping up another Vai project: a live album from Generation Axe, the all-star guitarist ensemble that Vai assembled with Tosin Abasi, Yngwie Malmsteen, Nuno Bettencourt, and Zakk Wylde. “Start with the minimal amount in your signal chain. A microphone into a good mic pre into the computer, or tape machine, or whatever you’re recording to. Don’t add anything unless you’re unable to get the sound you’re looking for and you can’t change it on the amp or guitar or pedal. “A lot of people like to start throwing mic pres, compressors, EQs, and all kinds of junk in the chain, but you need to start one by one and only add things if it’s needed, because you really hear the degradation. If you start with everything in your chain, you don’t hear what it sounds like without it. “When you add things one by one, you can hear if it’s getting better or worse, and that way, also, if there is a problem, you have an easier way of troubleshooting it. “When I record Steve Vai, we use a mic pre and microphones. We only use EQ if we feel like we’re missing something. We rarely use compression; we compress in the mix. “Know how to troubleshoot. If you hear buzz or noise, understand what your chain is, and make sure, before you hit record, that everything sounds the way it should. “As much of a benefit as YouTube is, it’s also a hindrance on people’s education, because they use it as a fast-track and hinder their experience because they’re not learning fundamental things. They overlook them because they’re 'boring'.